Washington and Lee University’s Williams School will hold its sixth annual Entrepreneurship Summit Sept. 29-30 with keynote speakers Ben Johns ’78, founder and CEO of SCOUT Bags, and Warren Stephens ’79, chairman, president, and CEO of Stephens Inc. The talks are open to the public. Both speakers will give their addresses in Stackhouse Theatre on Sept. 29. Johns will be at 11:15 a.m. and Stephens at 1:25 p.m.
Johns has supervised and owned seven different companies and has managed up to 500 employees over the course of his career. Johns and his wife, Deb, own SCOUT, a company that came from a merger of Park Designs and Bungalow to create a line of tote bags that blended fashion and function. Stephens began his career as an associate in the corporate finance department at Stephens Inc. Today, he is president and chief executive officer of the company. Under his direction, Stephens has grown its footprint from one corporate office, based in Little Rock, Arkansas, to 25 locations across the U.S. and with offices in London and Frankfurt. The Entrepreneurship Summit was launched in 2012 and has quickly become one of the university’s signature alumni events. The 2016 event included over 120 alumni and more than 200 students who came together to network and learn from each other. The event takes place over two days, a Friday and Saturday, and culminates with a networking dinner on Saturday night. 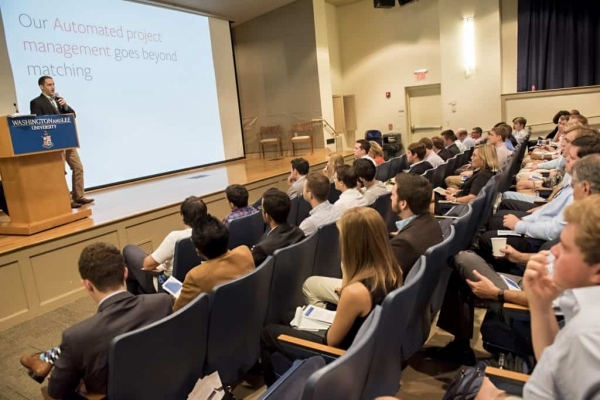 This year’s summit will feature more than 60 speakers who hold degrees from virtually all of W&L’s majors and is especially targeted around entrepreneurs who want to run their own company or for students from all majors who want to hear from alumni who’ve started businesses from scratch. The summit is open to the public during the day and a complete schedule of events can be found here. Registration is required to attend the event: https://www.wlu.edu/williams-school/events/entrepreneurship-summit/registration.